Hero Baby standard 2 is a follow-on milk (after using Hero Baby standard 1) for infants from 6 months. Hero Baby standard 2 is easy to digest and contains prebiotic fibres, nucleotides and important fatty acids DHA/AA, all nutrients that you also naturally found in breast milk. Each box contains 2 Hero Baby standard 2 foil packaging à 400 grams. In order to make you loose 100 ml follow-on milk 3 measuring spoons of 5 grams of powder in 90 ml of water. Are the unopened foil packaging approx. 2 year shelf life, after opening you need to use the contents within 4 weeks. 1 mix Hero Baby standard 2 follow-on milk is sufficient for 26 bottles of 200 ml. Hero Baby standard 2 follow-on milk is designed to contain the most important substances of breastfeeding. For this reason Hero Baby standard 2 such a logical choice because it is a complete and easily digestible follow-on milk that prebiotic fibres, nucleotides and contains important fatty acids DHA/AA. 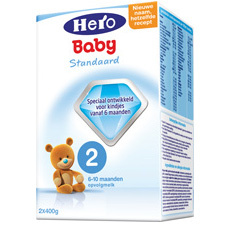 Hero Baby standard 2 follow-on milk is intended for infants from 6 months. Skimmed milk, demineralized whey (milk), vegetable oils (palm, rapeseed (low erucic acid), palm kernel, sunflower oil from Mortierella alpina, contains emulsifier: soy lecithin), lactose, galacto-oligosaccharides (GOS) (lactose), maltodextrin, calcium phosphate , potassium citrate, calcium carbonate, choline bitartrate, fish oil, magnesium chloride, sodium L-ascorbate, sodium citrate, magnesium phosphate, sodium chloride, potassium chloride, taurine, ferrous sulfate, calcium hydroxide, zinc sulfate, cytidine-5'-monophosphate (CMP), DL-alpha-tocopheryl acetate, ascorbyl palmitate, disodium uridine 5'-monophosphate (UMP), nicotinamide, adenosine-5'-monophosphate (AMP), disodium guanosine-5'-monophosphate (IMP), calcium-D-pantothenate, disodium inosine-5'-mono-phosphate (IMP), copper sulfate, acidity regulator (citric acid), retinyl acetate, thiamine hydrochloride, riboflavin, pyridoxine hydrochloride, manganese sulphate, folic acid, potassium iodide, phylloquinone, sodium selenite, D-biotin, cholecalciferol, cyanocobalamin. Nutrition Facts per 100 gr.